Advertising your business via banner advertising on Caravans for Sale is the ideal way to increase brand awareness and drive customers to your website. You can specify exactly where you want your message to appear from the numerous different banner slots available, so there really is a banner advertising option for all businesses and budgets, ensuring a high return on investment for you. To ensure you get the best possible response from your banner we can help target the most relevant audiences to put your banner in front of. 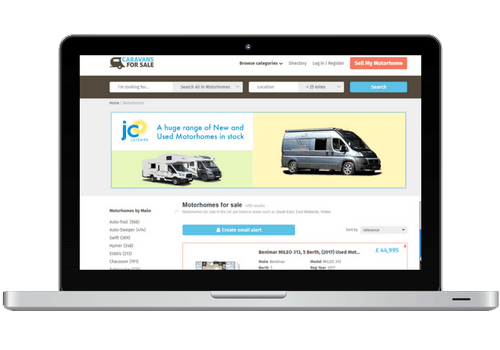 For example, if your business specialises in providing motorhome insurance, we can only host your banner in the ‘Motorhomes for sale’ section, so only people browsing the most relevant category will see your offering, increasing your chances of generating clicks. Banners on Caravans for Sale are providing industry-leading response rates because they are so highly targeted; Equestrian businesses targeting horse enthusiasts who are actively looking for a new equine related products and services. This high-impact banner visually packs a punch. Perfect for marketing an event or promotion. It can work in short sharp bursts throughout a weekend or over a couple of days in the week. This banner is the premier product for high conversion. The MPU banner will either appear on the search result pages or on ad detail pages, depending on the device. 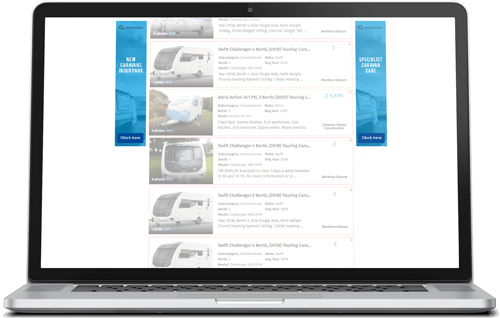 The banner can also be activated on Caravans for Sale automated emails to our users. Best for: Being seen everywhere! Never miss an audience with an MPU! This square banner has the benefit of being able to display on multiple devices, from phones, tablets, laptops and even on our automated emails that we send out to our thousands of users on a daily basis. 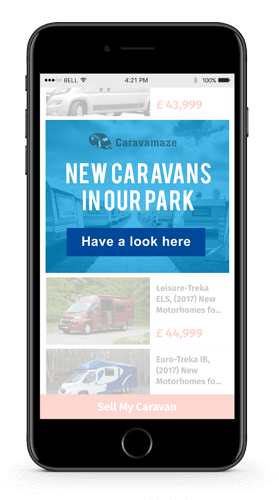 Native ads overcome the barrier of ad blocking software enabled by some users, as they are strategically placed within the Caravans for Sale content where viewers are looking anyway. Studies have shown that consumers look at native ads 50% more often than traditional banner ads. Take advantage of this new way of advertising and effectively become a part of our site! 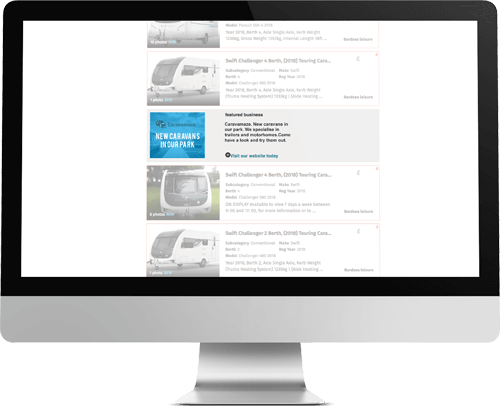 Your advert will appear within the listings on Caravans for Sale, which has been proven to attract superior visual attention and high brand awareness from customers. The MPU banner will either appear on the search result pages or on ad detail pages, depending on the device. The banner can also be activated on Horsemart automated emails to our users. “I must say, my account manager has been very helpful with pushing our new Infinity website.